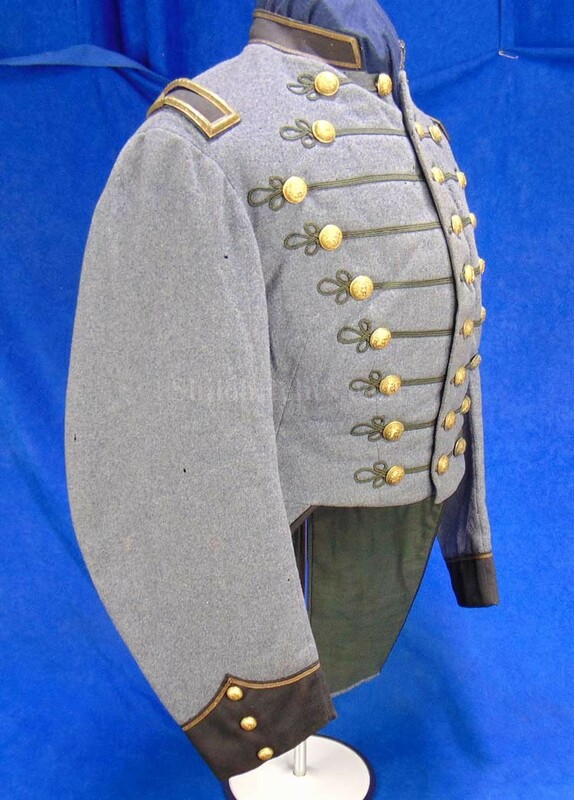 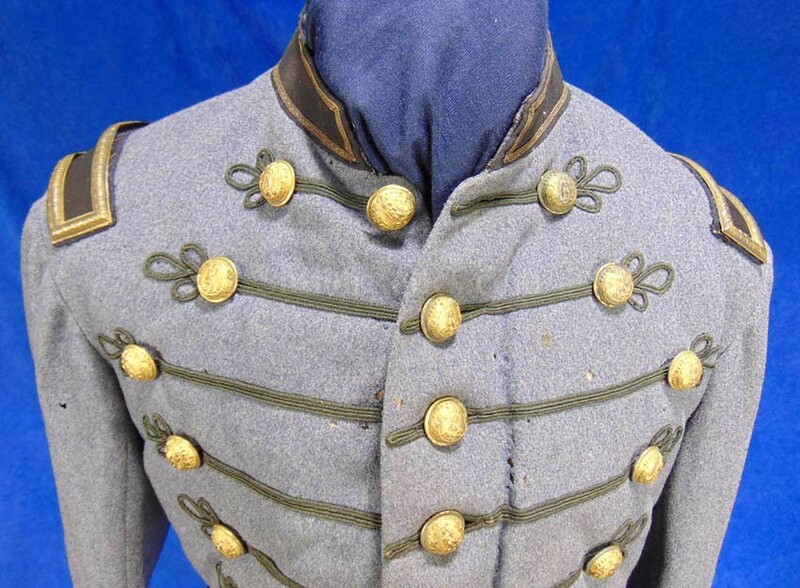 This is one of the prettiest Civil War Southern uniforms you will ever get a chance to own. 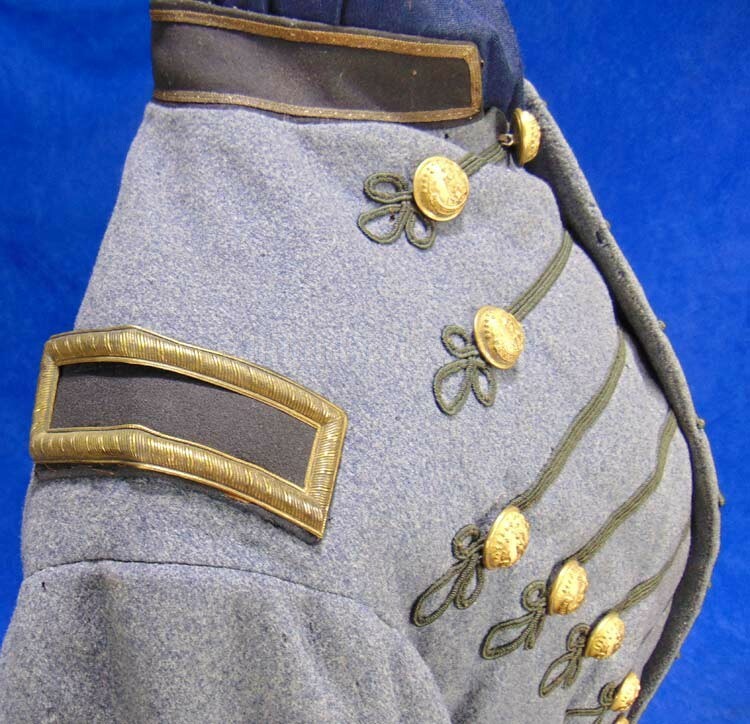 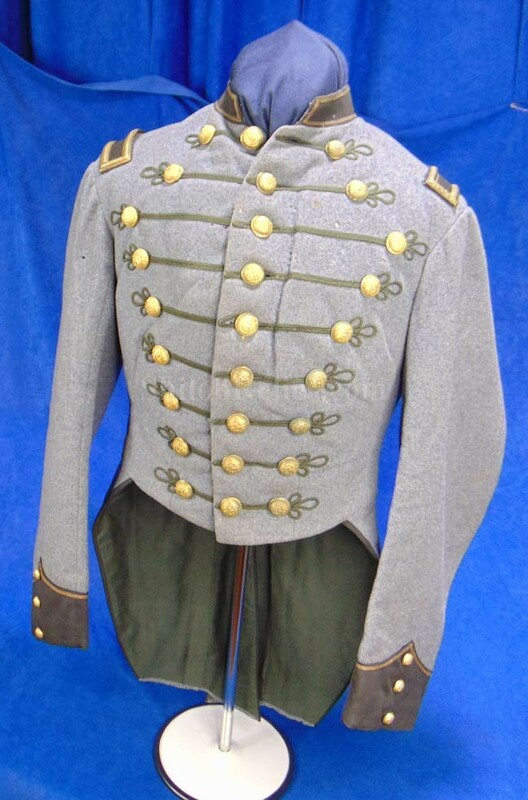 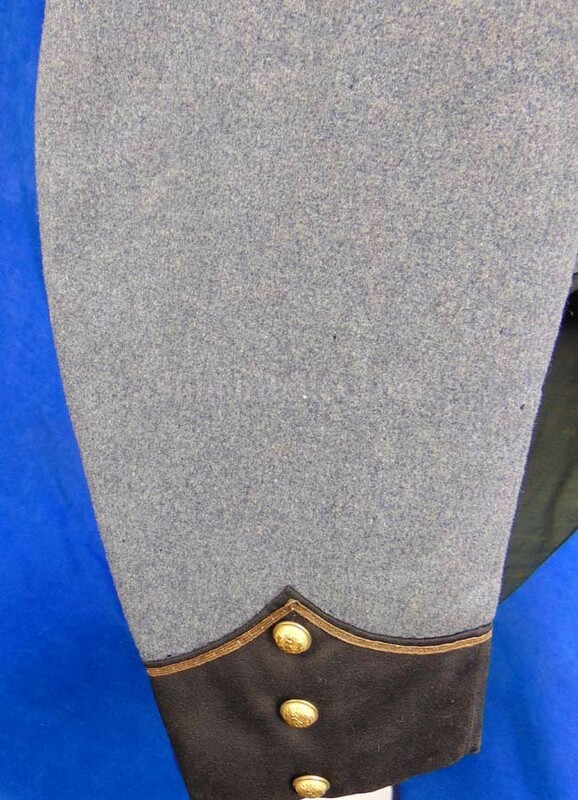 It is an original militia style Virginia uniform. 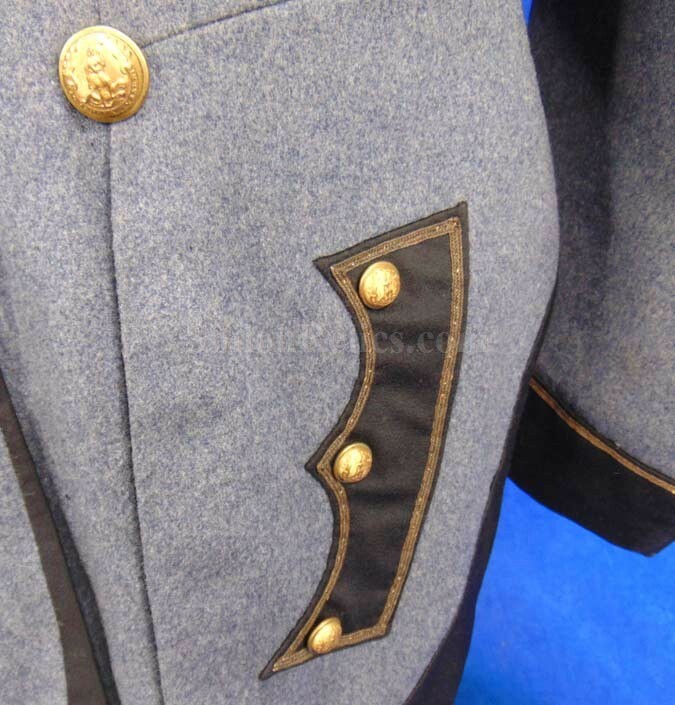 This is the pattern that many of the Southern soldiers from Virginia wore into battle in the early days of the Civil War. 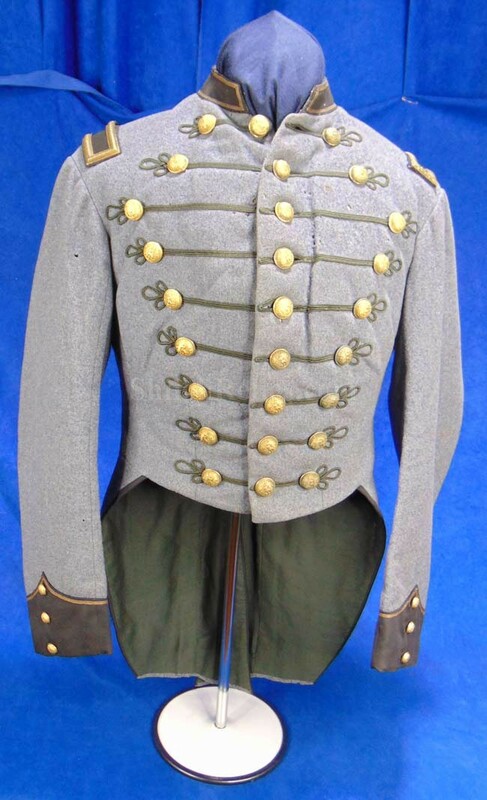 This coat would have been made about 1855 to 1861. 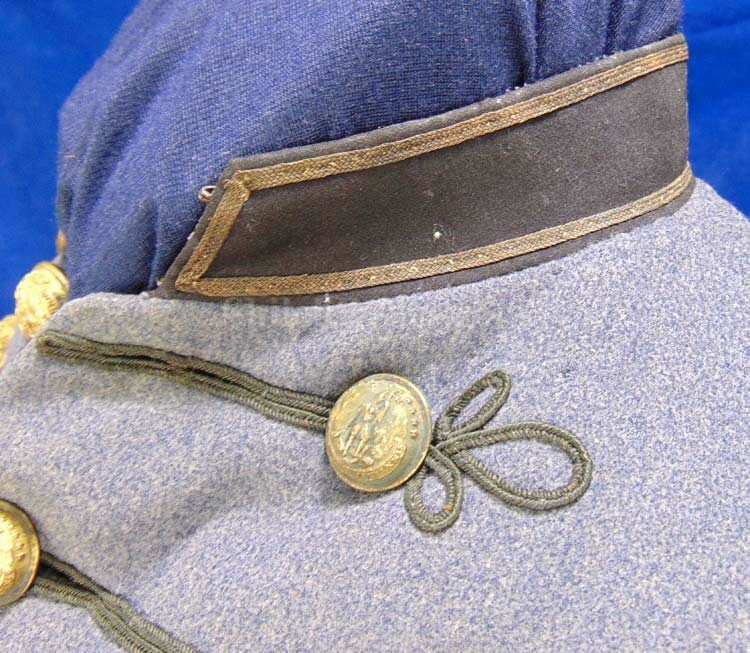 At the time there were many made but they were worn into the war and used up. 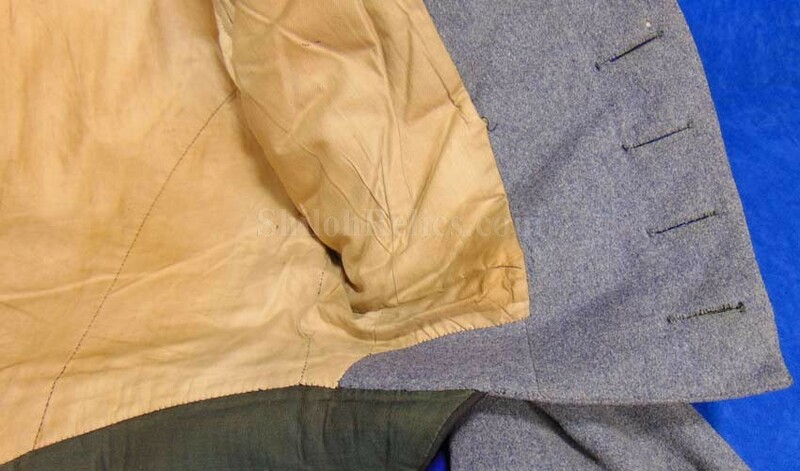 That is why we encounter the buttons but the coats are very seldom encountered. 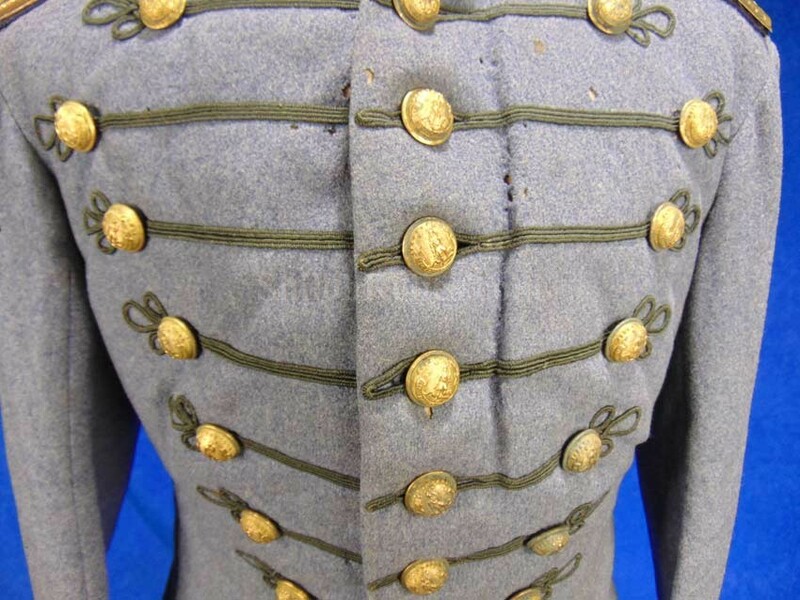 The buttons are all present and are 100% Civil War. 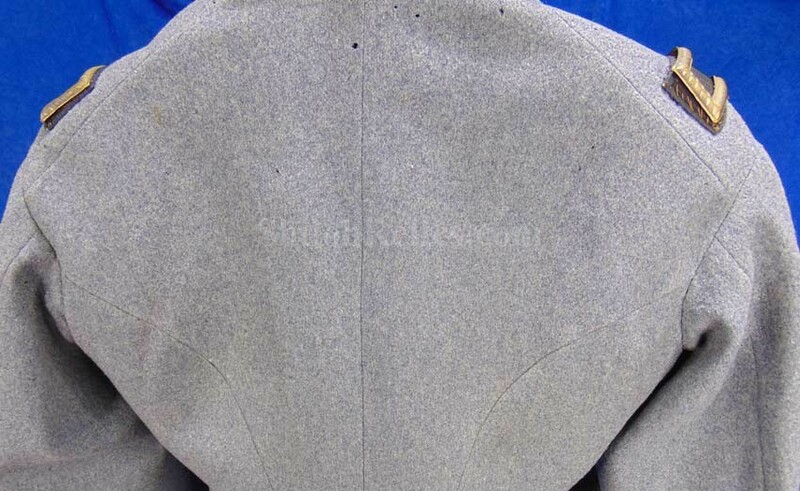 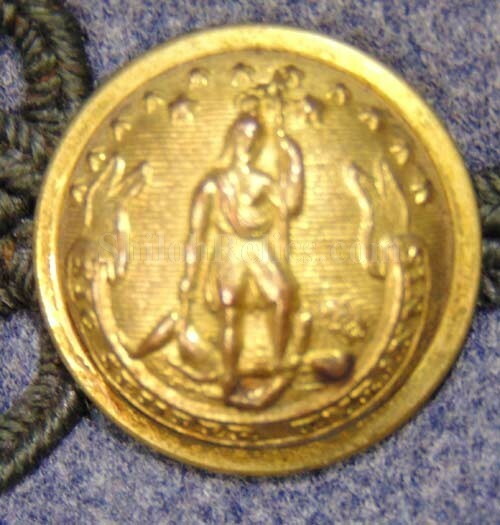 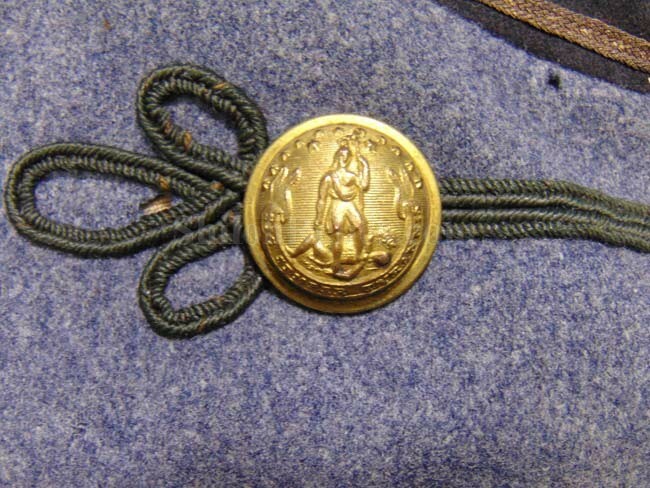 There are 27 coat size Virginia state seals in three rows of 3 on the front with 4 coat size buttons on the back. 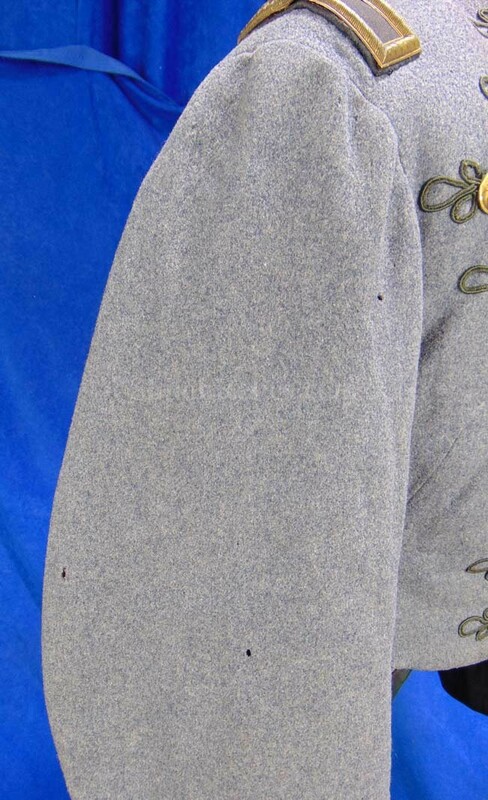 There are 6 small cuff size buttons with 3 on each sleeve. 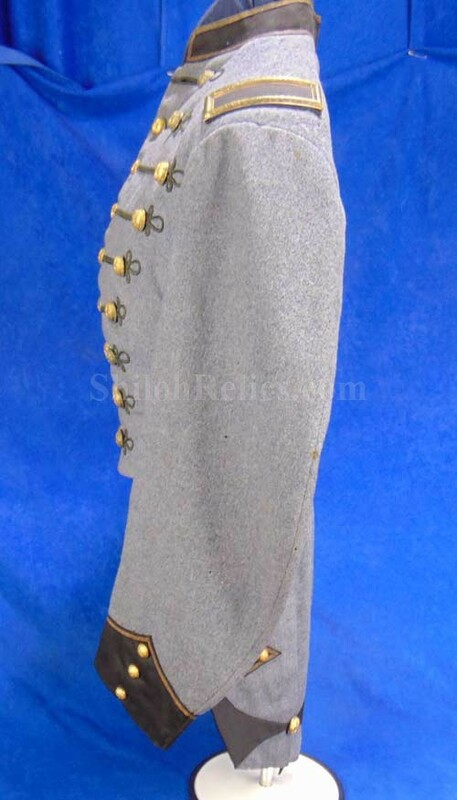 There are also 6 of the cuff buttons on the back of the swallowtail coat. 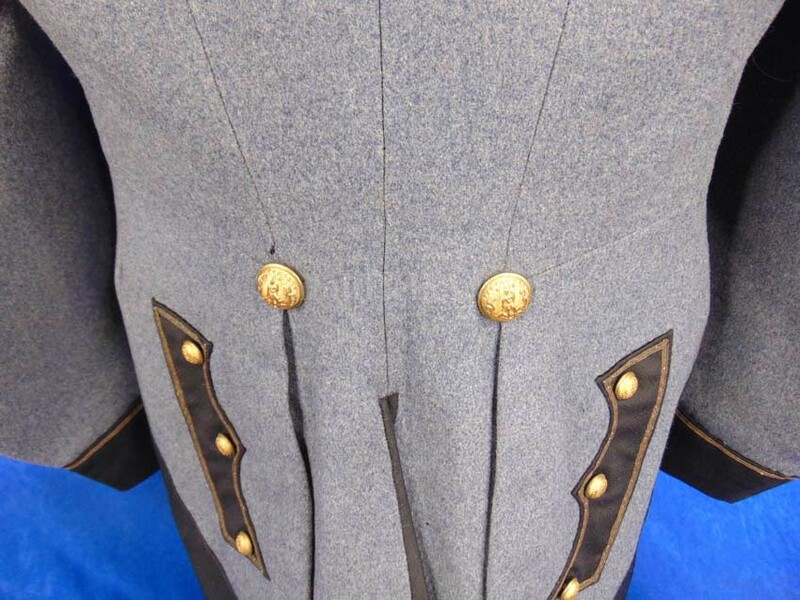 On the face of each button they have the classic Virginia state seal in the center with "VIRGINIA” at the top and "SIC SEMPER TYRANNIS” at the bottom. 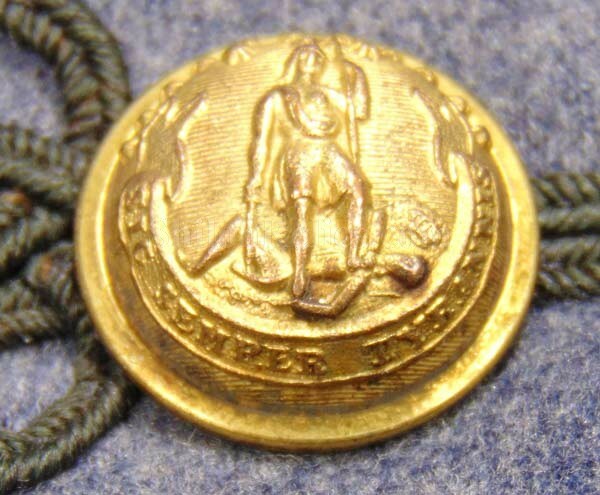 This is the motto of Virginia which translates to "THUS UNTO TYRANTS”. 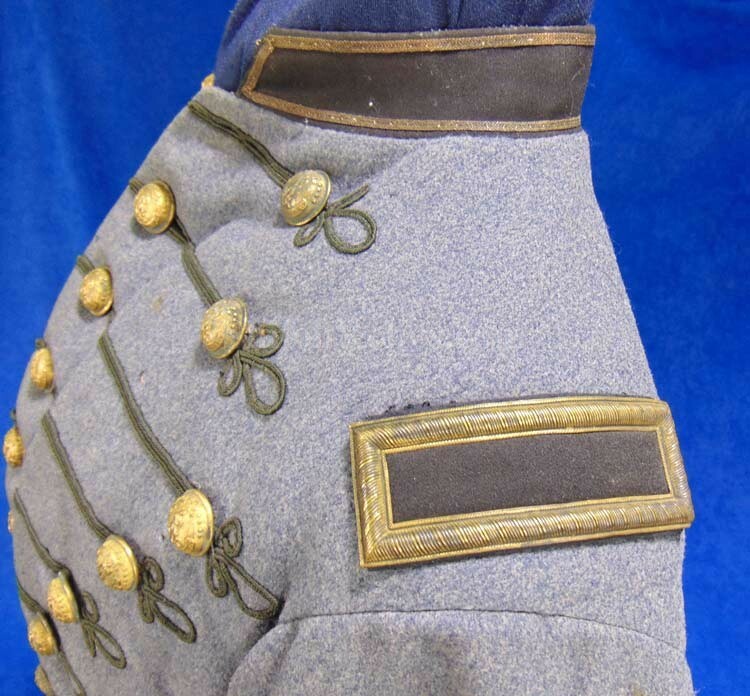 The original backs and shanks are present with the nice, clear Civil War backmark of "SCOVILL MF'G, / WATERBURY". 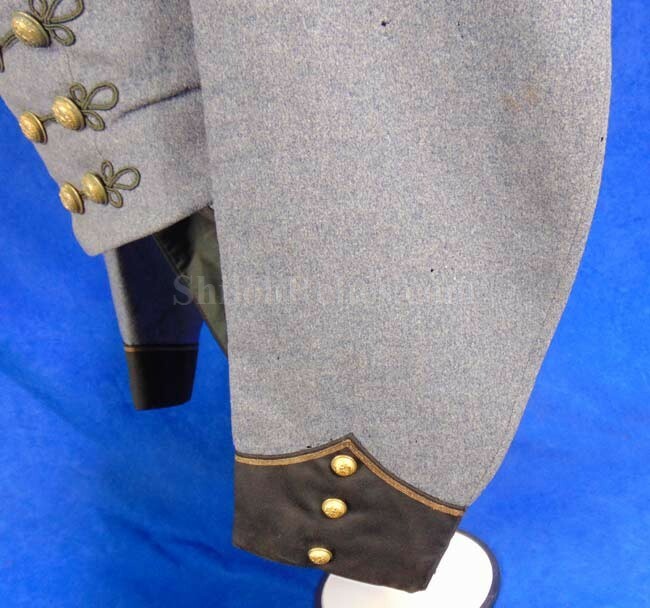 These are the staff officer’s versions and they are the style that is listed as VA20 in Albert’s button book and VA261A7 in Tice’s button book. 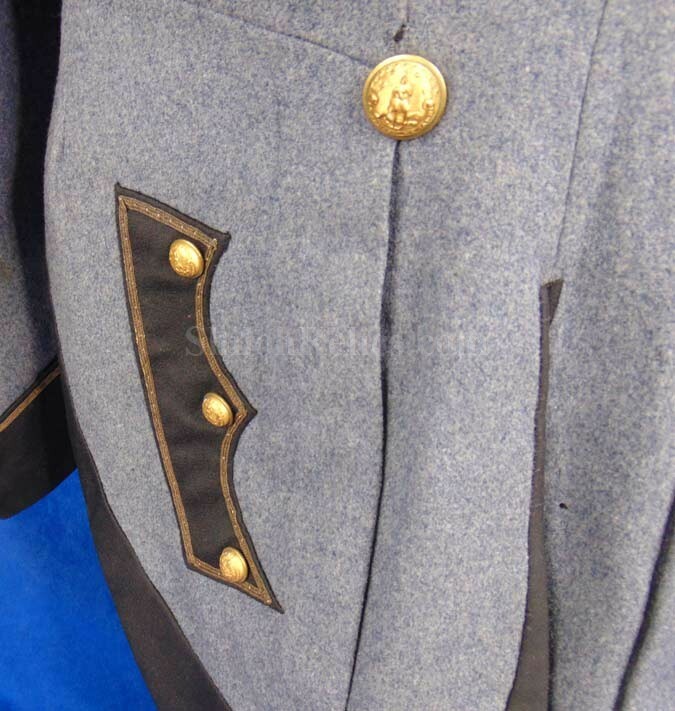 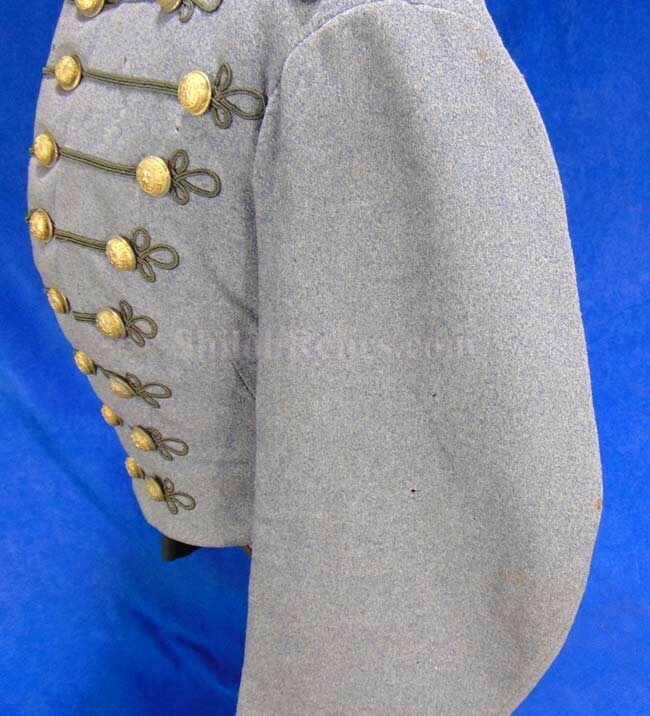 The body and sleeves of the coat are the wonderful cadet color gray. 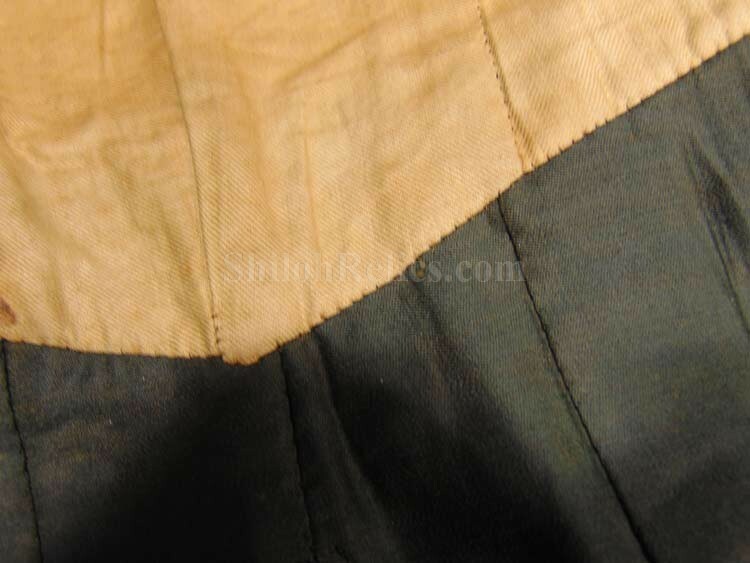 It is trimmed in black and gold with a gorgeous look to the cloth. 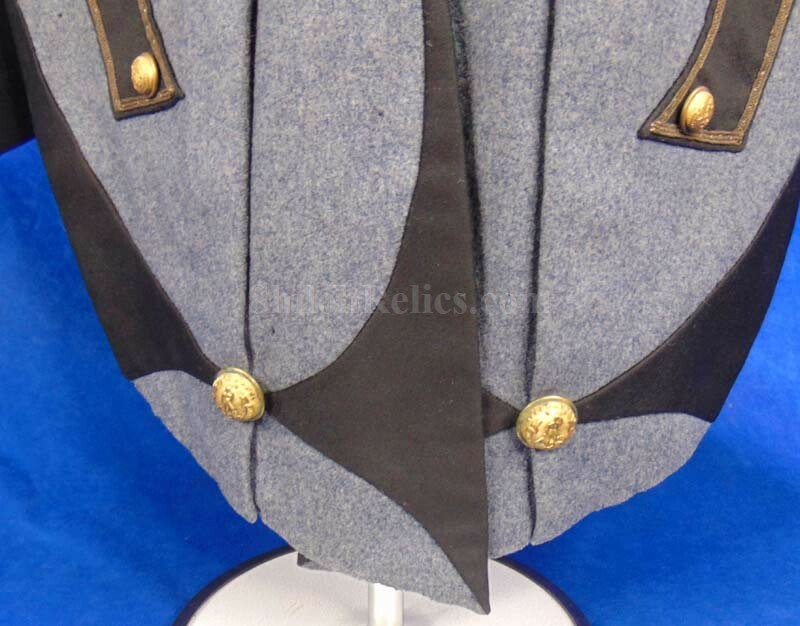 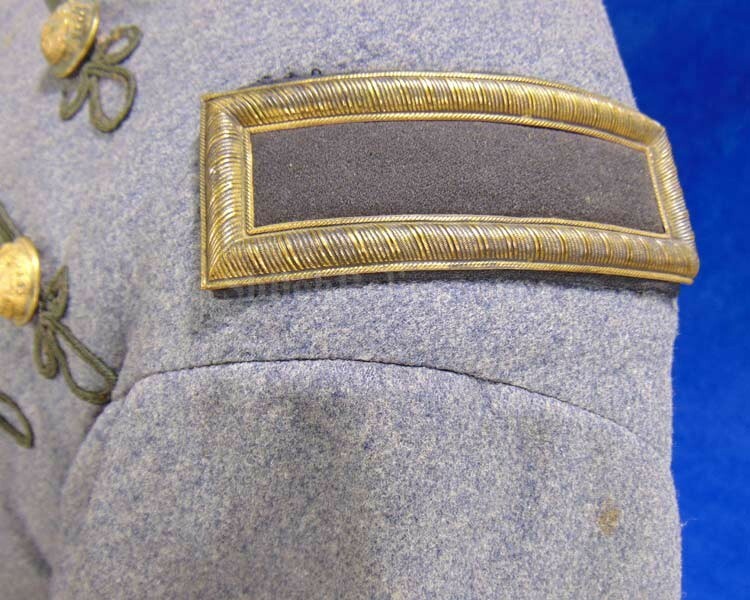 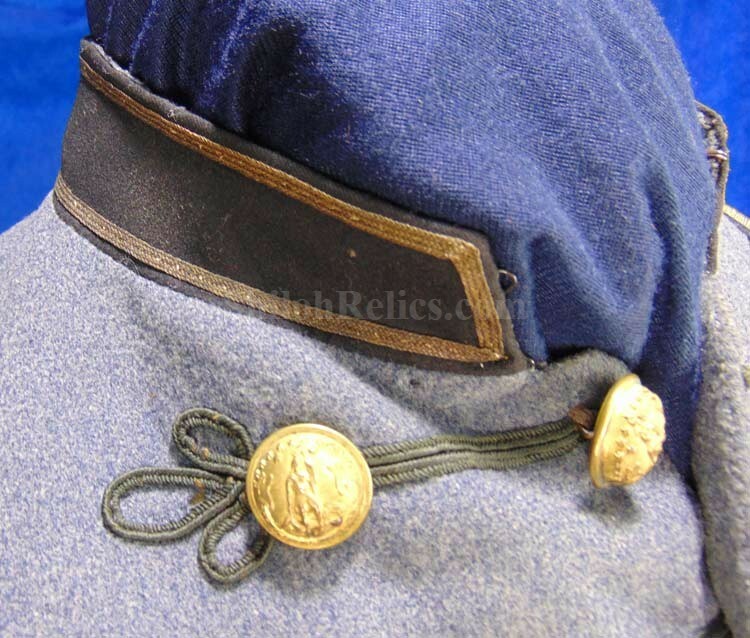 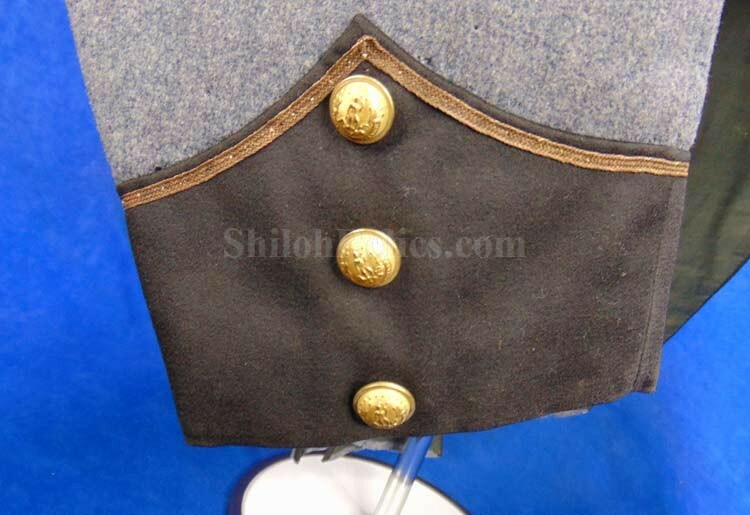 On the shoulders of the coat they have the original rank insignia intact. 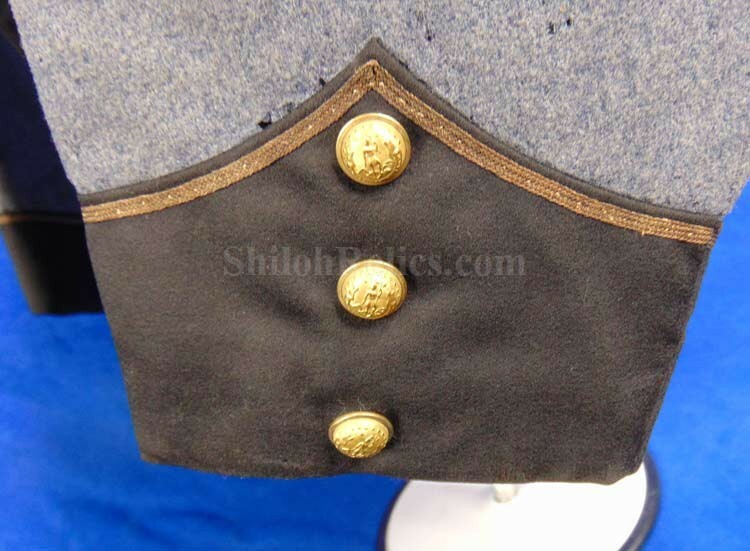 The insignia are the brass rectangles with the open center field. 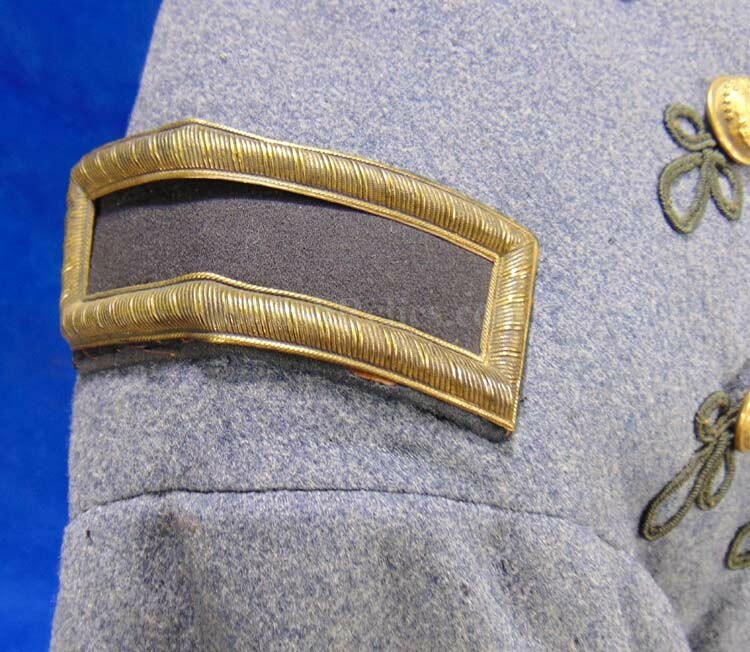 Since the center is open, it lets us know that the soldier's rank would have been that of a 2nd Lieutenant. 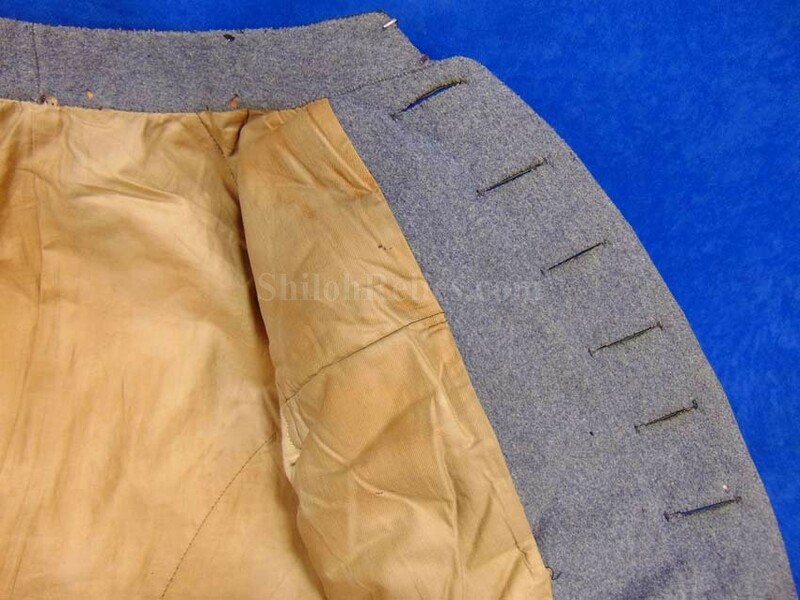 When you open up the coat you are greeted by the excellent original lining int he body as well as in the sleeves. 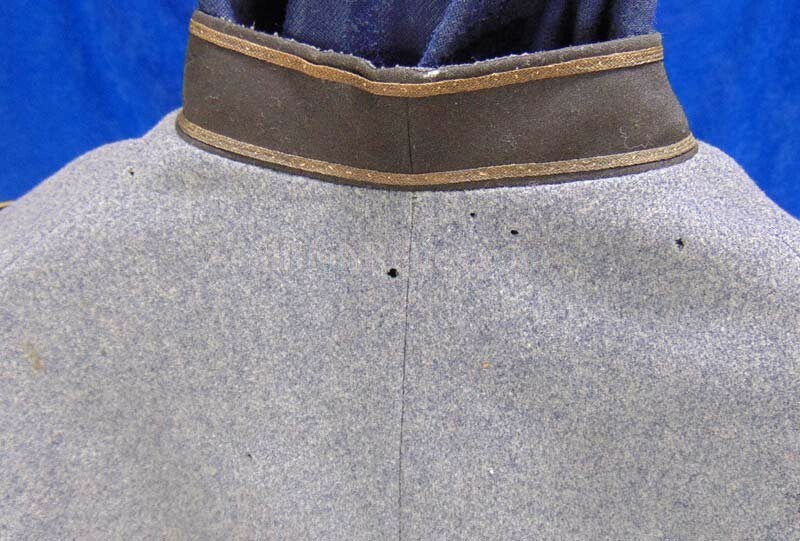 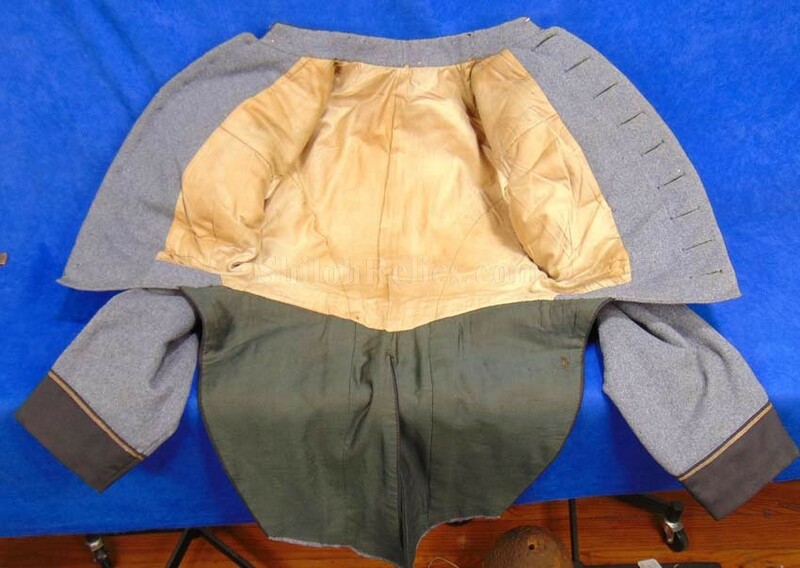 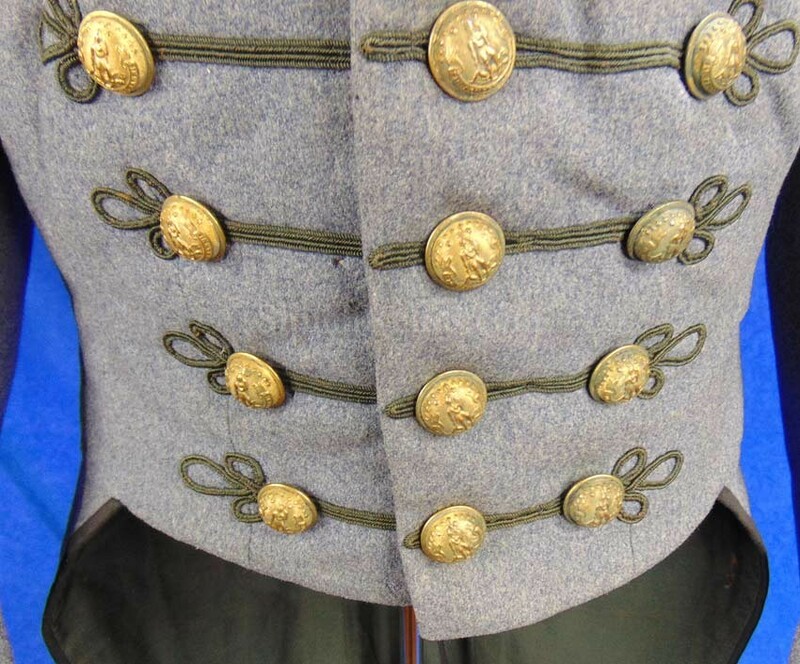 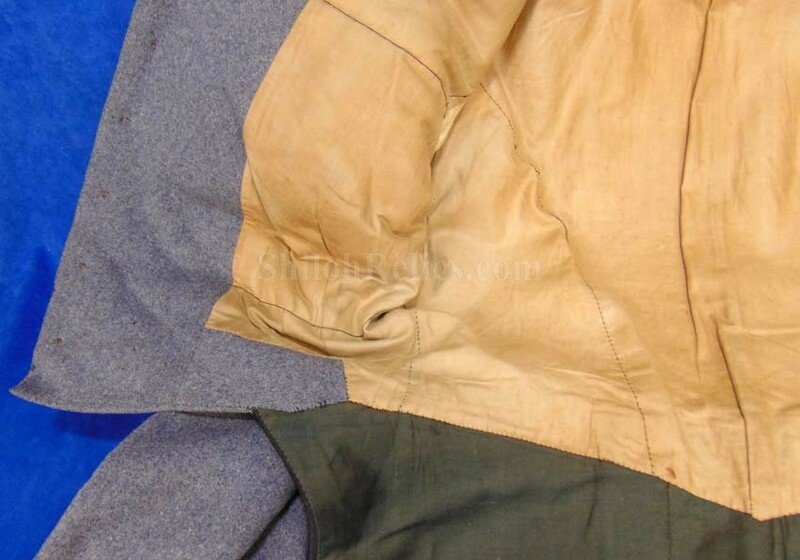 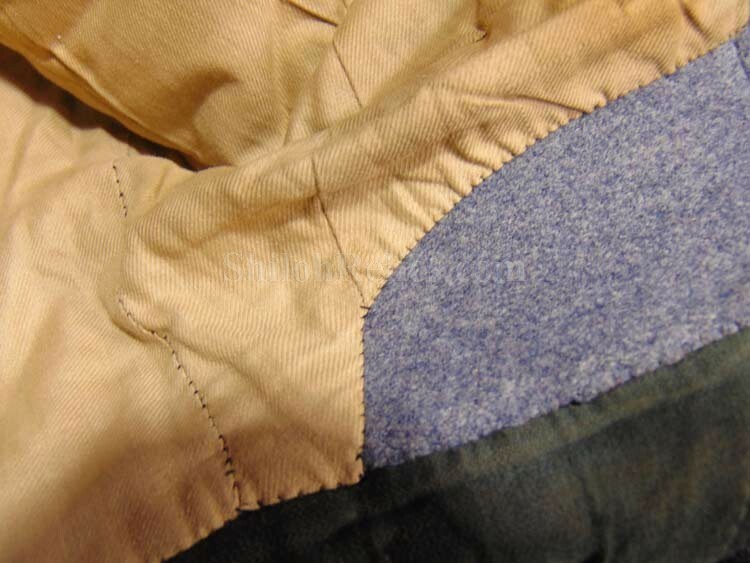 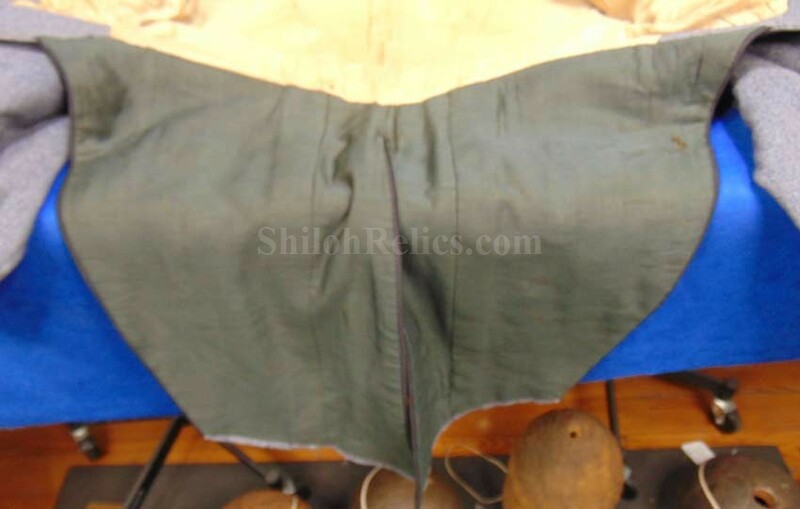 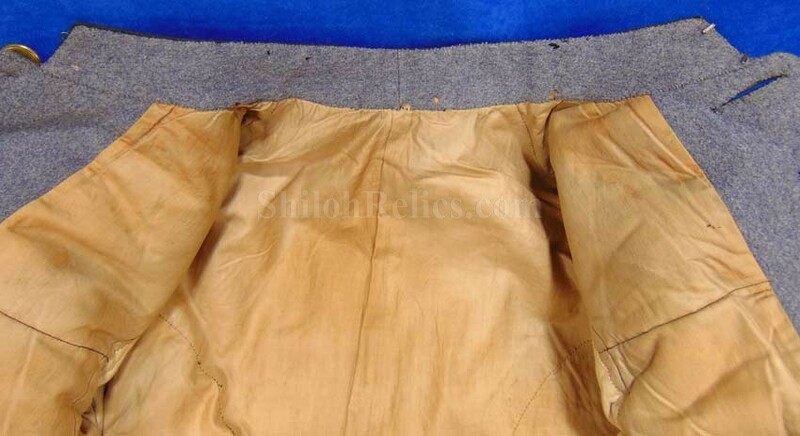 You can see that along the seams that the coat is constructed by hand which is the correct style of manufacture for a Civil War coat. 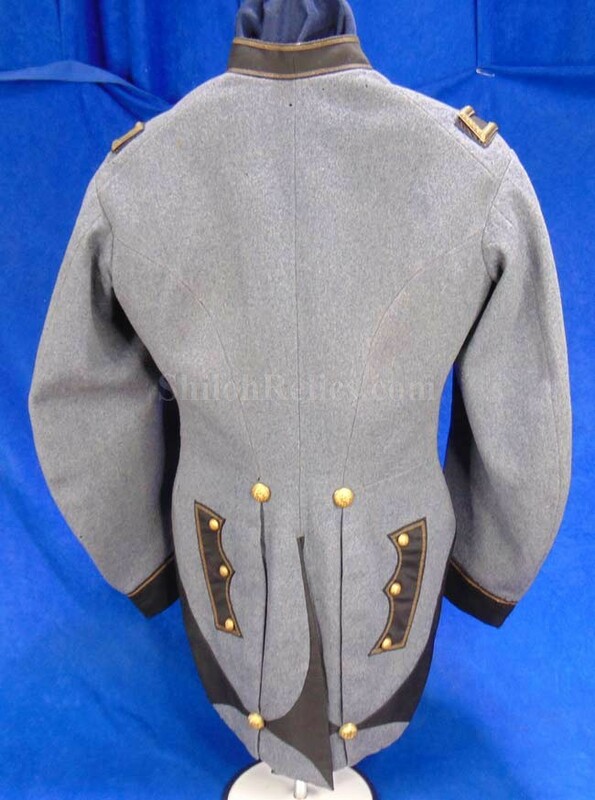 This coat is exceptional and displays as well as any coat you will get a chance to own.